Feb 04, 2017: Looking for cheap way to improve my lightning. Apr 24, 2017: 75 Gallon fish tank light? Jun 15, 2017: Low Light Succulents? Oct 19, 2017: Shopping list for new beardie - anything I should change? Feb 12, 2018: Light set up questions. 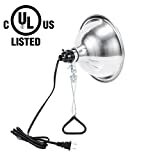 Apr 12, 2018: Where to buy these or similar grow light reflectors for E27 bulbs in europe? Aug 29, 2018: Can I use a ceramic infrared heat emitter with a light clamp?